Almost a year ago, I wrote a blog post recommending Garret Hutson’s debut mystery novel, In a Safe Town. Today, Garrett drops by my blog to talk about his second mystery novel, The Jade Dragon, which I also loved. His first novel is set in 1980s Indiana. The Jade Dragon is the first in a series set in 1930s Shanghai—and from here, I’ll let Garrett take it away. I was surfing the internet a few years ago, when I stumbled upon a news story about a rebirth of the old Shanghai jazz scene from the 1920s and ‘30s, and it really intrigued me. I followed links, learned more—and in the way internet surfing often does, it led me down all sorts of rabbit holes of information about the golden age of Shanghai, the “Paris of the Orient,” with its glitz, glamor, and intrigue. Perfect back-drop for a story! There was so much potential in this setting—radical extremes of wealth and poverty, even more than usual for the 1930s; an International Settlement governed by fifteen nations, but under nominal Chinese sovereignty; Korean exiles maintaining a provisional government right under the noses of the Japanese—I was in love with the idea, and began to imagine a basic plot—a pair of Americans out on the town, enjoying the famous Shanghai nightlife, when one of them gets murdered. I’ve always loved imagining what it was like to live in a different place and time, so naturally as both a reader and a writer I have been drawn to historical fiction. History is so much more than dates and events—it is about people and their stories. As a writer, I have been drawn to lesser-known stories, so I had a ball researching the world of Shanghai during the inter-war period. What would life have been like for me if I were dropped into 1935 Shanghai? Without doubt, there was special danger for someone like me, much different than my everyday life in Indianapolis in 2017. How would most people have dealt with that? What coping mechanisms did they use? How did they relate to others? How did others related to them? What relationships could I build in this world, and under what terms? And how did people of all walks of life defy the strictures of their day? I love exploring these questions, and the ways they create conflict and drama between characters—who reflect people just like you and me, whose stories were not recorded or have been erased. Real people passed through these places, with real dreams and concerns, and I want to make it feel that real to readers. 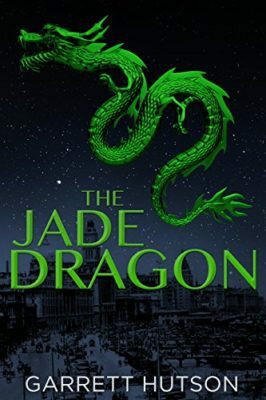 The Jade Dragon is about solving a murder, certainly, but it is also about broken relationships, characters’ doubts and personal baggage, and triumph over adversity and circumstance. That is my favorite part of writing a novel, and I am so excited when it comes together as it did. If readers love it as much as I did, then my joy is complete. Garrett Hutson is the author of The Jade Dragon, a literary historical mystery set in 1935 Shanghai, available from Amazon. He credits the term “Un-invisible” to an interim pastor who spent a few months at St. Peter’s United Church of Christ a couple of years ago. He is hard at work on the sequel to The Jade Dragon. For more information about the author and his books, visit his website at www.garretthutson.com. book recs, Garrett Hutson, guest posts, history, LGBT, research. Bookmark. Happy Book Birthday to The Weather War! Woohoo! I loved what I’ve read of The Jade Dragon so far, especially the past where I get to explore such a fascinating time. The idea of making the invisible un- invisible is such an interesting one, too!